Fans of Activision’s toys-to-life franchise have been dreaming up their own Skylands champions since the first game arrived back in 2011. This year’s Imaginators finally harnesses that creativity, giving players the ability to piece together the Skylander of their dreams. Plunder Fist. His fists plunder all the time. 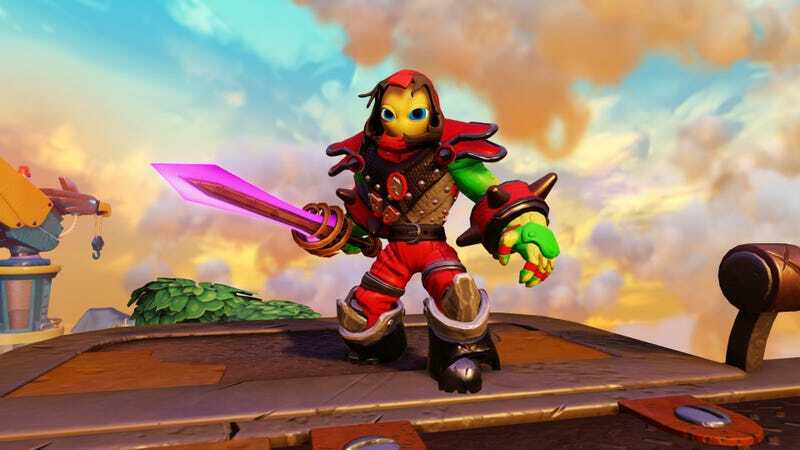 While designers working on the Skylanders series have created some pretty imaginative characters over the years, they’ve got nothing on the goofy stuff fans young and old alike have been dreaming up. Skylanders Imaginators aims to put those fertile imaginations to work. The process begins with a new class of toys known as Creation Crystals. Tuned to one of the ten different elements—Life, Undead, Air, Fire, Water, Earth, Magic, Tech, Light and Dark—placing a Creation Crystal on the game’s portal begins the character creation process. Looks kind of like a Star Trek warp engine. Players choose one of ten different battle classes (Sorcerer, Brawler, Knight, etc.). Once the class is locked in the real fun begins. A deep character creation system allows players to customize every aspect of their Skylander. Body parts, costume pieces, colors, special effects, weapon types, catchphrases, voice type and pitch, abilities, special moves—it’s a ridiculously deep system. Activision says there are a googol of potential combinations. That’s one followed by 100 zeros, for those of you who weren’t paying attention in class. I wasn’t allowed to play with the character creator directly at my preview, which is probably for the best. I did confirm that rainbow pony tails were an option, and players could modify the length and fullness of that rainbow pony tail, which is a pretty good indicator of the scope Toys For Bob is going for. The power to create custom characters has a perfectly reasonable story explanation. Long ago an ancient race harnessed the power of Mind Magic to create the Skylands. Once finished, the ancients locked away the power, fearing it would fall into the wrong hands. Cut to present day, and the Mind Magic has fallen into the wrong hands. Series villain Kaos has unlocked the power and is using it to create an army of Doomlanders to take over the world. Players must harness the Mind Magic to create heroes capable of saving the day. Of course one can’t expect brand-new heroes to know the ropes. That’s where the new toys come in. Along with those fancy Creation Crystals, Imaginators also has 31 new Sensei figures joining the ranks—20 new characters, and 11 former villains. One of the big issues I had with the Skylanders toy line was that there were never any villain figures. Imaginators fixes this oversight by giving us reformed villains, characters that have spent the time since 2014's Trap Team mending their evil ways, like the Golden Queen, who should be very easy to paint. The returning villains and new characters like the avian King Pen and the delicious Tri Tip are each attuned to a specific fighting discipline. Acting as mentors to players’ custom creations, they unlock new abilities and weapons for the new apprentices and raise their level cap. It’s a Mr. Miyagi, Daniel-san sort of relationship, only Mr. Miyagi is a giant penguin and Danien-san is something totally random with a rainbow pony tail. Oh I get it, it’s a play on Kingpin! Tri Tip is the best triceratops name ever. The 31 mentor toys will be it for this season of Skylanders. The 300 or so toys already released will be playable in the game, and certain classic characters like Jet-Vac and Spyro will tag along in themed game levels, teaching new characters the ropes, but as far as new toys go, they’re all new. Skylanders Imaginators launches on October 16 in North America for PlayStations 3 and 4, Xboxes 360 and One and the Wii U. That’ll give fans time to save up for the $74.99 starter pack ($99 for the obligatory Dark Edition), 29 $14,99 Sensei toys and the 99 $9.99 Creation Crystals it will take to store one character from each of the ten fighting disciplines for each of the ten elements. The pony-tailed Skylanders army in my head waits patiently for its moment to come.